Are you clicking? You should be. This program is changing shopping. It's easy, no scissors necessary. 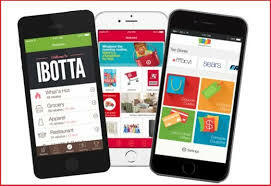 Once you have the My County Market App rolling, add Ibotta to your shopping clicks. It's a nationwide rebate program when you can clip even more offers that you paid on Paypal. It also works with your max card so no hassles for you. Just see their offers, click and get money. Special Hack: Yes, you can double up on Digital offers and printed coupons. If you have a newspaper or at home printed coupon, most will scan in addition to the digital coupon. You can definitely double dip on the Ibotta rebates and paper coupons. I picked up $10 just for signing up with Ibotta on my phone. Boom! Direct to my paypal account. Did you know that sometimes the Ibotta offers match Penny Pinchers? This week, Little Debbie has a donuts offer that matches the Penny Pincher. It's a double win.